The 122nd Annual Convention (Jalsa Salana) of the Ahmadiyya Muslim Community in Qadian, India, concluded with a faith inspiring address by the World Head of the Ahmadiyya Muslim Community, the Fifth Khalifa (Caliph), His Holiness, Hazrat Mirza Masroor Ahmad, on 28 December 2016. The address took place exactly 125 years after the Jalsa Salana was first established by the Founder of the Ahmadiyya Muslim Community, the Promised Messiah, His Holiness, Hazrat Mirza Ghulam Ahmad (peace be upon him). His Holiness addressed the final session via satellite link from the Baitul Futuh Mosque in London. Over 14,200 people attended the Convention in Qadian, while more than 5,200 gathered in London for the concluding session. During his address, His Holiness spoke of the outstanding moral and spiritual example set by the Founder of Islam, the Holy Prophet Muhammad (peace be upon him) and the unparalleled impact he had upon his followers. Hazrat Mirza Masroor Ahmad explained the impact of the example set by the Holy Prophet (peace be upon him) upon those around him. Hazrat Mirza Masroor Ahmad said that despite being the most beloved of God Almighty, the Holy Prophet Muhammad (peace be upon him) manifested the highest standards of humility at all times. His Holiness cited the example of the victory of Mecca, the city where the Holy Prophet Muhammad (peace be upon him) and his followers had been severely persecuted for many years and driven out of. When eventually the Holy Prophet Muhammad (peace be upon him) returned in victory, he peacefully marched into the city without any desire for vengeance and showed an unparalleled example of forgiveness and compassion. Mentioning the attribute of gratefulness of the Holy Prophet Muhammad (peace be upon him), His Holiness said that Founder of Islam (peace be upon him) would always turn to Allah the Almighty in gratitude. Furthermore, the Holy Prophet (peace be upon him) would also express gratitude to people. For example, he remained forever grateful to his esteemed first wife Hazrat Khadija (may Allah be pleased with her) for her support, love and devotion throughout their blessed marriage. 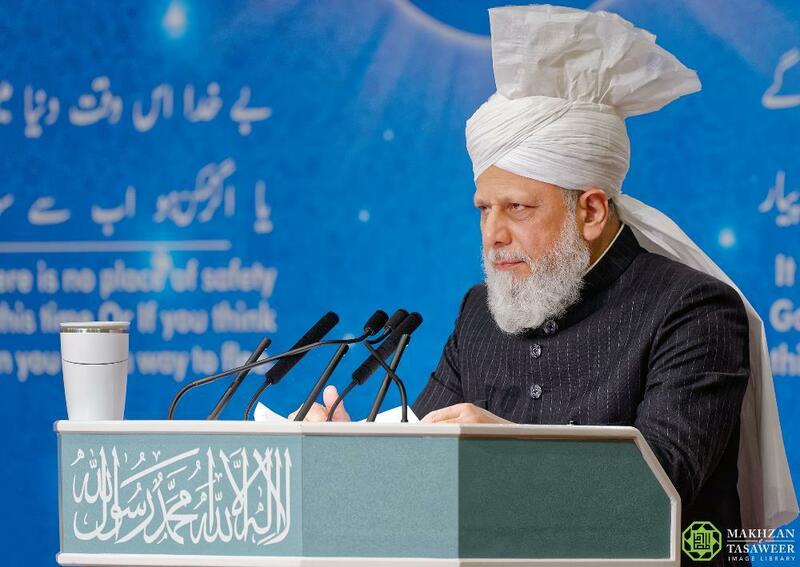 Hazrat Mirza Masroor Ahmad said that Muslims were duty-bound to follow the example of the Holy Prophet (peace be upon him) and so it was incumbent upon Muslim men to treat their wives with love, kindness and to be grateful to them. His Holiness also quoted the example of how the Holy Prophet Muhammad (peace be upon him) expressed gratitude to the Christian monarch of Abyssinia, King Negus (Najashi), who gave protection to some Muslims when they escaped the persecution of the Arab Meccans. The Holy Prophet (peace be upon him) remained forever grateful to the Christian King and personally received a delegation sent by King Negus out of gratitude. His Holiness concluded his address by praying that Muslims worldwide came to reflect and honour the values taught by the Holy Prophet of Islam (peace be upon him). The session concluded with silent prayers followed by various poems recited by attendees in Qadian via satellite link.